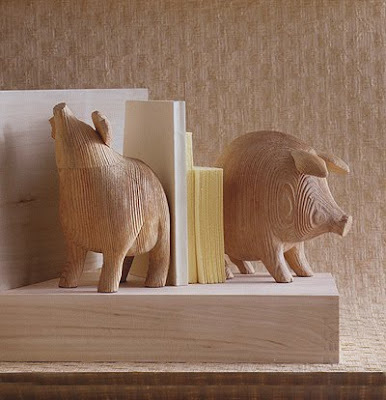 Sculptural Piglet Bookends. You will love Il Porcello (Italian for Pig)! These beautiful piglet book ends are original, well-designed and feature clean modern lines. These portly pigs hold up books with porcine charm. These beautiful modern book ends are hand-carved from repurposed pine timbers by master artisans. These sweet piglets feature a sand-blasted and waxed finish. Knots, small cracks and color variations are part of their natural appeal. A perfect desk- and shelf accessory, our Il Porcello bookends provide the perfect whimsical touch for the business or the home office. Makes a very unique gift idea too.